Fewer arrived each year ! Please reach out soldier if you are in need of assistance. These organizations are here for you. Thank a Soldier – just saying thanks. 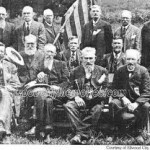 American Legion – since 1919 .. where the vets go.